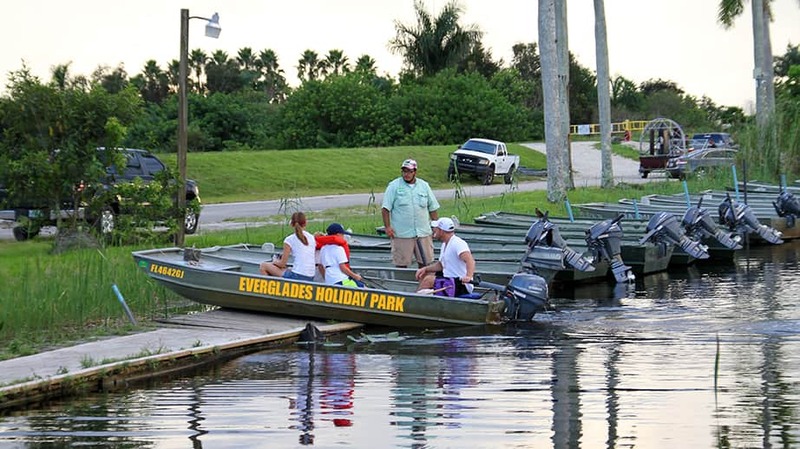 Everglades City Florida is on the Barron River south of Tamiami Trail in Collier County, Florida. Its nickname is "Gateway to the Ten Thousand Islands". It is at the end of State Road 29 and takes about 35 minutes to drive there from downtown Naples. The population is around 600 people, more or less. 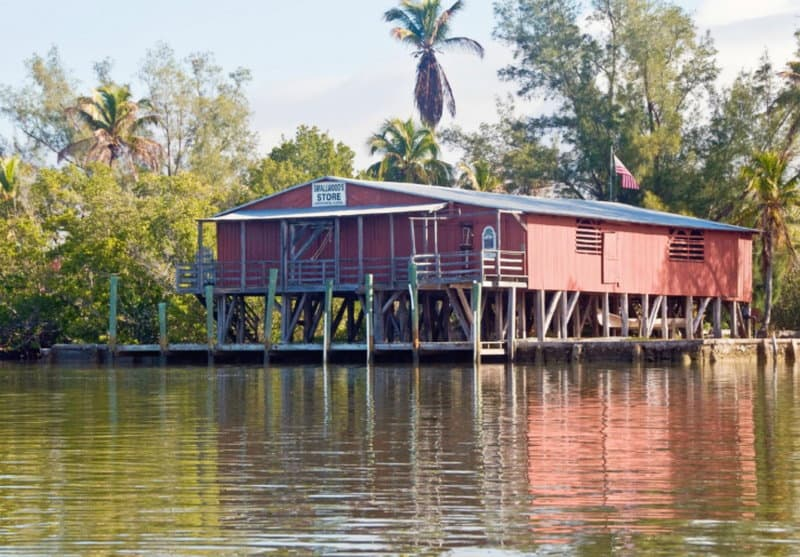 Everglades City is a convenient place to stay while exploring the Everglades, Chokoloskee and the Ten Thousand Islands. It is also a place where hardworking Florida Crackers eked out a living from the shallow waters of the mangrove fringed Everglades. Charlton Tebeau has written a nice book, The Story Of The Chokoloskee Bay Country", that tells about the history of the entire area. A long time resident of Chokoloskee Island, the late Totch Brown , wrote "Totch: A Life In The Everglades" that has the authentic flavor of somebody who was born and raised there. Long before Totch's ancestors came to the Chokoloskee Bay country, the Calusa Indians lived in the area. Early settlers said that the Indians grew potatoes along the banks of the Barron River. The first white settlers began to show up after the Civil War. The first permanent settler was William Smith Allen who came to the area in 1873. Another early pioneer was George W. Storter, Jr., who raised sugar cane. Storter also opened a trading post and post office, and began to entertain Yankee tourists who came to Everglades City on their yachts to hunt and fish. Everglades City is joined to Chokoloskee Island by a narrow causeway. In earlier times it was a true island, even more isolated than it is now. 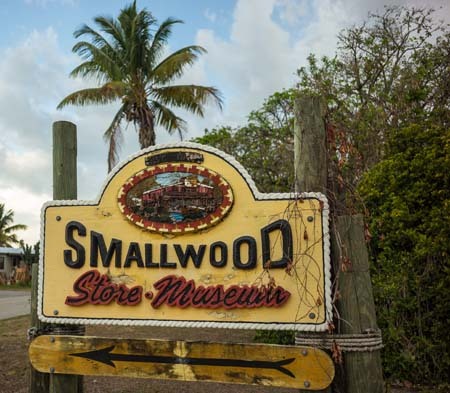 In 1906, Ted Smallwood opened a trading post in Chokoloskee to serve the early settlers and the Seminoles who lived in the area. 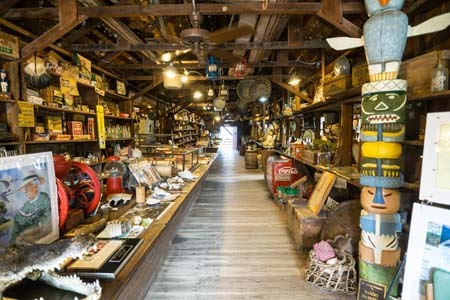 The store is still standing and is open now as a museum that gives you a great idea of what the area was like. His house eventually became the Everglades Road and Gun Club. It has been visited by many famous people, including U.S. presidents. The entire Chokoloskee Bay area, Marco Island and Naples were in Lee County in those days. Barron Collier, a successful Memphis businessman, came to the area in 1922 and bought thousands of acres. In 1923 the Florida Legislature created Collier County from Lee County, and Everglades City became the county seat. It was first named Everglade, then Everglades, and finally Everglades City. Collier pushed the completion of the Tamiami Trail (US-41) from Naples to Miami, and in 1929 built State Road 29 south to Everglades City Florida. It was the first time the little town had ever been connected to the rest of Florida by road. Hurricane Donna visited southwest Florida in 1960 and left tremendous damage in its wake. Everglades City was especially hard hit. 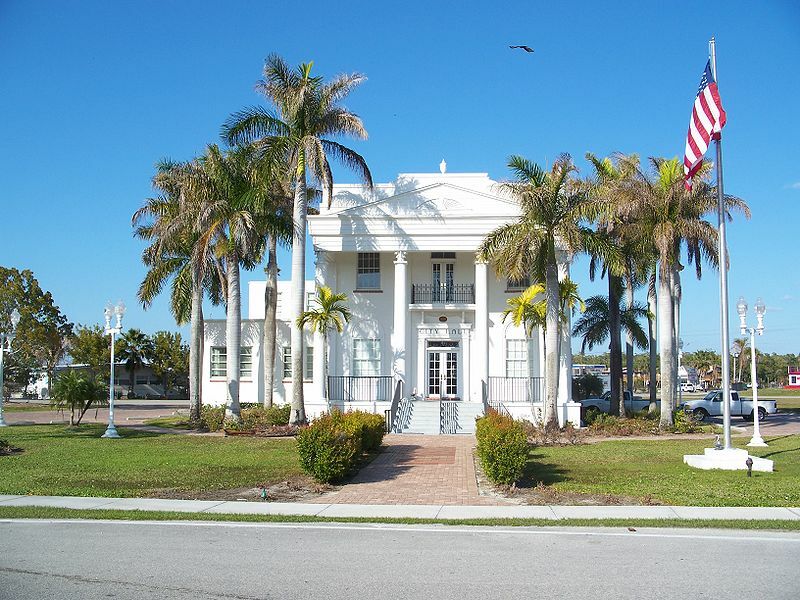 The county seat was then moved from Everglades City to East Naples, where it still is today. In the 1970's and 1980's, Everglades City and Chokoloskee became notorious for their trade in "square grouper", a euphemism for bales of marijuana. Boats and airplanes were dropping the stuff into the mangroves of the nearby Ten Thousand Islands where it was picked up by locals and delivered all over the United States. During Ronald Reagan's "War On Drugs" most of the activity was stopped and had completely dried up by the end of the 1980's. 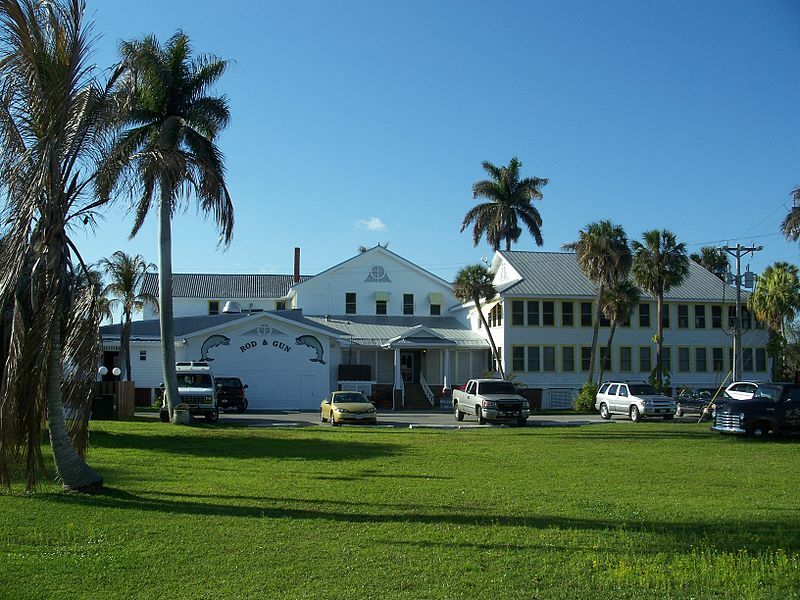 The Rod and Gun Club (dining room shown in picture above), and the old Collier County Courthouse. 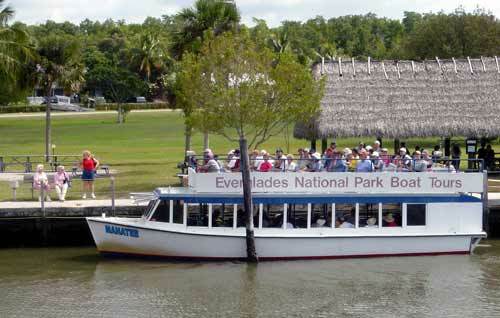 Everglades City is also the main entrance to Everglades National Park. The park provides boat tours and so do some private companies. Several places also rent canoes and kayaks for some individual exploring of the mangrove coast. 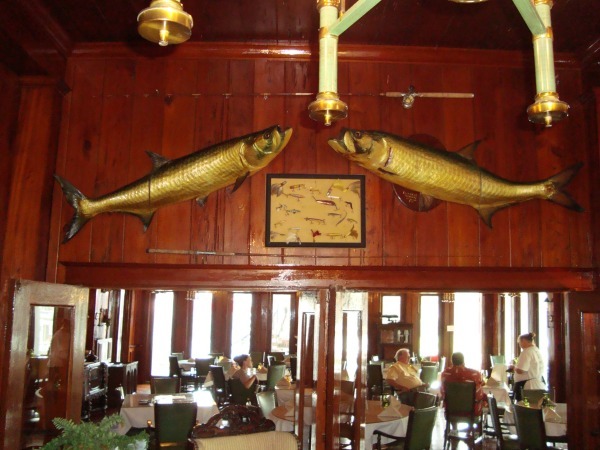 There are several nice little restaurants in Everglades City. 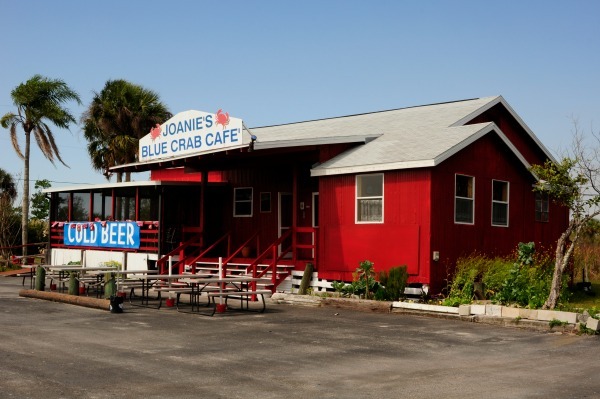 We like to go back up to Tamiami Trail, turn right at eat at this place, Joannie's Blue Crab Cafe.